Who else is excited that it’s Monday?! I know, I may be abnormal in that I look forward to the start of a new week. But, I have found that what I focus on expands. Isn’t that true? I know, I don’t have to go to work on Monday mornings. But I do have 6 children with boundless energy and we homeschool, so all that energy is with me all.day.long. I still find reasons to be happy at the start of a week. However, my energy is not unlimited like my children. I have limits, lol. There are plenty of nights where I am up with the baby and don’t get enough sleep. There are nights when I am wired because I am working on a project and don’t want to stop. There are days where I’m just feeling old and worn out. I love serving my family, but I do have my limits. And much to my chagrin, I can only have so much coffee. 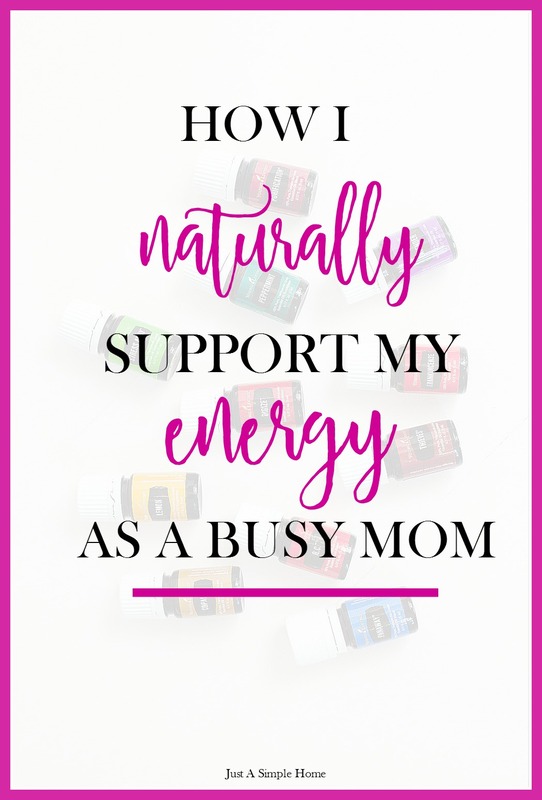 However, I’ve been using essential oils and essential oil infused products with great success to support my energy levels throughout the day…especially in the afternoon slump. Sounds crazy to you? It did to me too, until I tried it. I am far from perfect, but I try my best to limit chemicals in my home and processed ingredients in my food. We have been on a natural journey for years now and I am learning more all the time. En-R-Gee is a fabulous essential oil blend of Rosemary, Juniper, Lemongrass, Nutmeg, Idaho Balsam Fir, Clove and Black Pepper. These oils are uplifting and energizing. I use this oil first thing in the morning with a drop behind my ears and on my wrists. It helps me SO much. I re-apply in the afternoon, if needed. En-R-Gee is also a great essential oil to diffuse. Citrus oils are so invigorating! Citrus oils are cold pressed from the rind and are not acidic like the pulp. Drinking Vitality citrus oil water doesn’t harm tooth enamel, and there are other benefits to this too. I also love to diffuse citrus oils – Lemon, Lime, Grapefruit, Orange, Tangerine or the Citrus Fresh blend. Citrus Fresh is a blend of Orange, Grapefruit, Mandarin, Tangerine, Lemon and Spearmint. Yum! Citrus oils are cheap, which is so nice!! I always have these on hand for so many reasons. I have never been a fan of those energy drinks you can buy in a store. Have you read the ingredient label?! You don’t want that stuff in your body. I am so thankful for NingXia Nitro. I don’t drink it every day – just when I need an extra special boost. NingXia Nitro supports normal energy levels and alertness to help you with a busy day. NingXia Nitro is around $2.77 a tube which is definitely less than other energy drinks full of chemicals and other synthetics, so it’s a valuable, healthy alternative that I use on occasion. I love this oil! Clarity essential oil is an excellent blend of Basil, Cardamom, Rosemary, Peppermint, Rosewood, Geranium, Lemon, Palmarosa, Ylang Ylang, Bergamot, Roman chamomile, and Jasmine. It invites a sense of clarity and alertness. I apply behind my ears and or diffuse it! I don’t use ALL of these things every day. I just use what I have and what I feel like using, depending on what I need on that day. There’s options, and they are natural! Have you had enough of feeling unproductive all day? Start thinking about what you can do to change that. Besides more rest, consider trying some essential oils that can make a huge difference. It is a natural way to support your energy as a mom! I highly recommend starting with the Young Living premium starter kit. It includes Lemon, Peppermint and other invigorating oils like Stress Away. You can always add En-R-Gee, Nitro, Clarity and other citrus oils to your collection down the road. You really have so many options with a starter kit. I want to help you in your journey as a wife and a mom. I want to encourage you to take care of yourself, so you can pour into others. You can not pour from an empty cup! Click HERE for more details on getting started with essential oils! Click HERE to join my FREE Essential Oils 101 class tonight! It’s all online, so you can come in your pj’s! I have an interview today so am going to put peppermint on my temples to keep my alert! Thank you for the great recommendations. Peppermint is one of my all time favorite oils. I love the idea of diffusing while we are doing school work! I love the idea of turning to natural energy boosters instead of relying on caffeine or energy drinks! Thanks for the great recommendations! I found a combination of supplements that has REALLY helped my focus, energy levels & stress levels! I take GABA, L-Theanine, B-Complex, Vitamin D, Omega-3, and a food-based multivitamin every day and it’s made all the difference for me. I should give essential oils a try, too–I know that lavender is calming and citrus is rejuvenating, but that’s about the end of my knowledge! So many great suggestions! I would definitely like to try peppermint and clarity! And they are so easy to use. Love the peppermint oil and use it often. I need to get some Clarity next! Thanks for sharing! 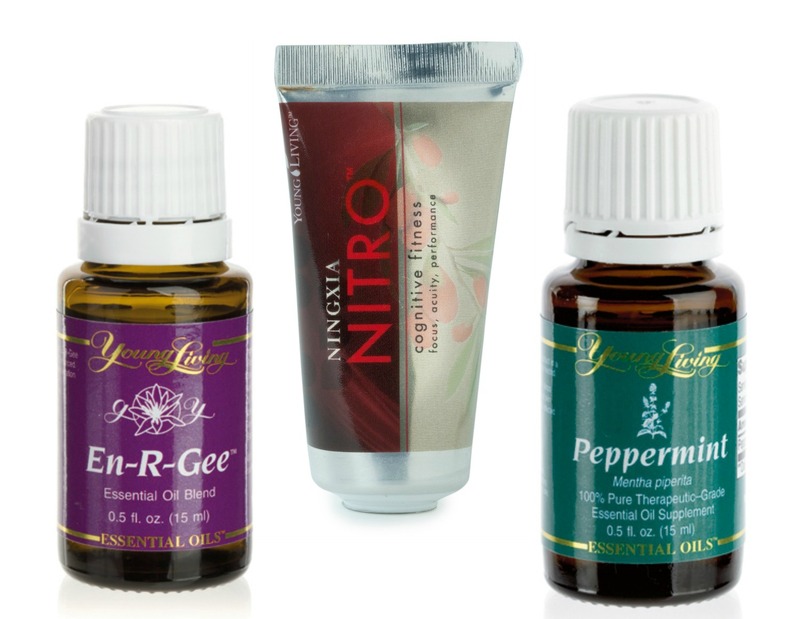 I think I need to get some of the En-R-Gee oil … it sounds like the perfect way to start my morning! Love this post, Terryn! I am waiting for En-R-Gee to come in now! I cannot wait to use it for dealing with long work days and school! Peppermint is probably the oil I use more than anything! I have several bottles on hand! If I used lime and orange oils in water, is that good, or does it taste bitter unless I add something to it? I never thought about using essential oils to increase energy. Thanks for sharing these tips! I may have to try it out, I’m always tired in the winter months. Great post! I actually use a little bit of Rosemary in my hair to massage in before bed sometimes. These oils are priceless!